Foundation tree damage! Although you may think that roots cannot harm the foundation of your home, you are mistaken. 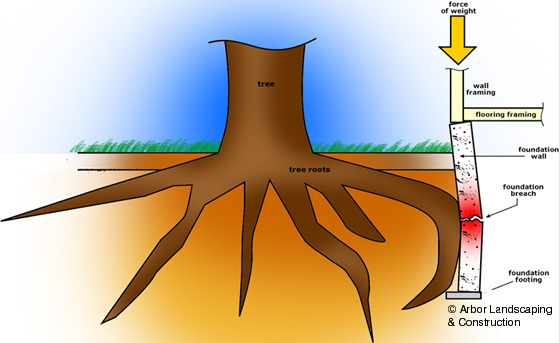 Tree roots can be an enemy to your homes foundation if they come into contact with the concrete or block or the dirt underneath your foundation.A mature tree, for example, can take in as much as 30 gallons of water in a solitary day. This drains the moisture of the soil nearby and can lead to reduced strength in the neighboring dry soil. They can push against the foundation of your home, causing it to crack or gap, which can cause damage to every part of the home. That is why it is important to plant any trees carefully to ensure that you will keep your home and foundation safe and strong.